Why aren’t cats allowed to mingle? Veterinarians never mix cats from different families. Having to find their place in a constantly changing social group causes stress in many cats. Do you ever let the cats out into the common area? Yes, cats are let out of their rooms frequently but on an individual basis. Long-term boarders will be invited to spend as much time out of their room as feasible because the longer the boarding stay the more attention a cat needs. My cat likes a fresh litter box. How often do you scoop? Always twice a day at the very least and more often as needed. Older cats and diabetic cats need it more often. Some highly fragrant cats will receive immediate attention. Can I bring extra treats? Why do you not require rabies or feline leukemia vaccinations? Since cats from different families will never mingle and our windows are screened to prevent bat exposure, the risk of transmission of feline immunodeficiency virus or feline leukemia virus or rabies on our premises is zero. We stringently require proof of up-to-date vaccination against the air-borne diseases (FVRCP). We have a large cat family. Can you accommodate us? For larger families, or for house-mates who need a bit more elbow room, we have cat doors between a few of the rooms so a large family can use two adjoining rooms. Do you have an outdoor enclosure? Can I board my diabetic cat with you? Yes, by prior arrangement and if he or she is a stable diabetic and has had a fairly recent check-up. Why does my indoor cat need a flea treatment when I know he/she doesn’t have fleas? We do realize that some may be annoyed by this policy but it is for everyone’s protection and to ensure that no cat ever goes home with fleas. What if my cat needs a veterinary exam during his/her stay? How is that handled? If, in the opinion of Dr. Baillie, your cat needs a veterinary exam, you will be contacted, if possible, and he/she will be taken to your veterinarian. We request that you make financial arrangements with your veterinarian before boarding your cat and that your veterinarian understands your wishes regarding medical treatment while you are away. What if I phone or email or fill out a reservation form and don’t hear back from you? We always try to respond within 24 hours but if you don’t hear from us please call or email us! © 2019 Lands End Cat Resort. All Rights Reserved. 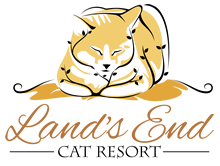 Construction of Land’s End Cat Resort by Gordon Hemsworth Construction, formerly Hemsworth Master Builders.